Miss Anne E. George, the author of the following article, is Dr. Montessori's first American pupil, and the first teacher to apply the Montessori method in the United States. Before going to Italy to study with Dr. Montessori, Miss George had been for five years a primary teacher in the Chicago Latin School, and before that a teacher in the New York Military Academy at Cornwall and in the Roland Park School at Baltimore. Since the Montessori method began to attract the attention of American educators, the question most frequently asked has been whether the system can be applied to the education of American children. Miss George's experiment is of especial interest in its bearing on this question. My interest in the Montessori system was the natural outcome of my ex­perience as a primary teacher. It had been my good fortune to work in schools where the fundamental Montessori idea, that of mental liberty, of de­velopment from within, was a ruling principle. In the Chicago Latin School the little children have a separate building, which, strange as it may seem, has always been called by Miss Vick­ary the "Children's House." Years ago she substituted little tables and movable chairs for stationary desks and benches, furnished abun­dant and convenient blackboard space, and in every way endeavored to create an environment suited to the needs of little children. In such surroundings and under such guidance it is not surprising that my work tended more and more toward individual freedom. With a class of six-year-old children such freedom must express itself in action more than through abstract les­sons. This meant, of course, much "hand work," and for years I had realized that the manipula­tion of materials ordinarily at hand required a great deal of direction and interpretation by the teacher before they became of value to the child. This direction did not do much toward making the children independent, and I found myself constantly discarding material as too difficult for the first grade. We did achieve order and dis­cipline with activity to a great extent, but I felt that this control came more or less as a re­sponse to my wishes, and was not an outgrowth of the actual work done by the children. About this time a friend wrote to me from Italy of a wonderful woman, a physician, Maria Montessori, who had not only seen the real need in primary education - an opportunity for self-development and for self-mastery in the child, but who had been able, through her peculiar genius, to evolve a practical system. Miss Risser's description of the schools where little children moved about happily, each absorbed in his own business in life, aroused in me a deep interest. The sense-training games of which she told seemed to represent the simple preparatory exercises for which I had been seeking in my effort to make hand work of real value to very little children. This letter made such an impression upon me that I went to Italy to learn something of the method at first hand. Dr. Montessori took me to her schools, showing me in detail how she gave her lessons. The impression made by those morn­ings has stayed with me and has been my guide in all my work since. Dr. Montessori's simplicity was a revelation. Whenever we entered a class-room, I distinctly felt that a new and sweeter spirit pervaded the place, and that the children were, in an indescribable way; set free. Yet there was order in everything. With a straightforwardness often stripped entirely of words, Maria Montessori taught, or, to use her own word, "directed," her children. She treated the children, not as automatons, but as individual human beings. She never forced her personality or her will upon them, and made none of the efforts to attract and interest which I had often made use of. In an eight months' course which I took with Dr. Montessori the following year, I obtained the schooling in her method that prepared me for my work in this country. The first Ameri­can Montessori School was established under the auspices of Mr. Frank A. Vanderlip and several of his friends and neighbors at Tarry­town, New York. Externally, Dr. Montessori's Casa dei Bam­bini bore little resemblance to this first American school. She made her first experiments in the model tenements of the San Lorenzo district in Rome - a section which has the same relation to the Eternal City that the East Side has to New York. She drew her children from the homes of poverty and squalor and too frequently of ignorance and vice. 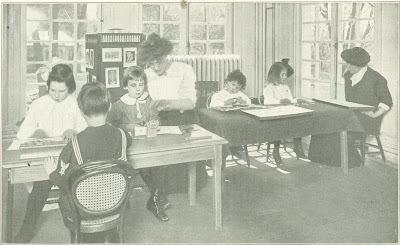 The American Montessori School, on the other hand, had its headquarters in a beautiful house overlooking the Hudson. My children all came from cultured families, whose greatest ambition it was to give their chil­dren everything possible in the way of education and rational enjoyment. We recognized, how­ever, that these external differences had no especial bearing upon the Montessori idea. That, superficially, there are marked differ­ences between two sets of children with such diverse environments, goes without saying. Naturally, children who have been conscien­tiously nurtured from their birth develop greater dependence upon those nearest them and upon each other than those who have had to shift for themselves from the time when they were babies. But, after all, these differences are only on the surface. The fundamental impulses and aspirations of childhood are the same in the San Lorenzo quarter of Rome as on the Hudson. All children have essentially the same minds, the same hearts, the same natures. From the first, therefore, I had no idea of "adapting" an exotic product to American conditions. I had observed Montessori work from day to day in Rome, and my only ambition was to do for American children precisely what she had done for Italians. The children had their school-room in a part of the piazza closed in with glass. They under­stood from the very beginning that this was their room. There was nothing in it that they did not own and could not use - the light rugs, the little movable tables at which they worked, the little wicker chairs, the blackboards adjusted to their height, and the Montessori materials placed in order upon low book-shelves. The odd dozen children who were suddenly given this inheri­tance were fairly representative of childhood at its best. 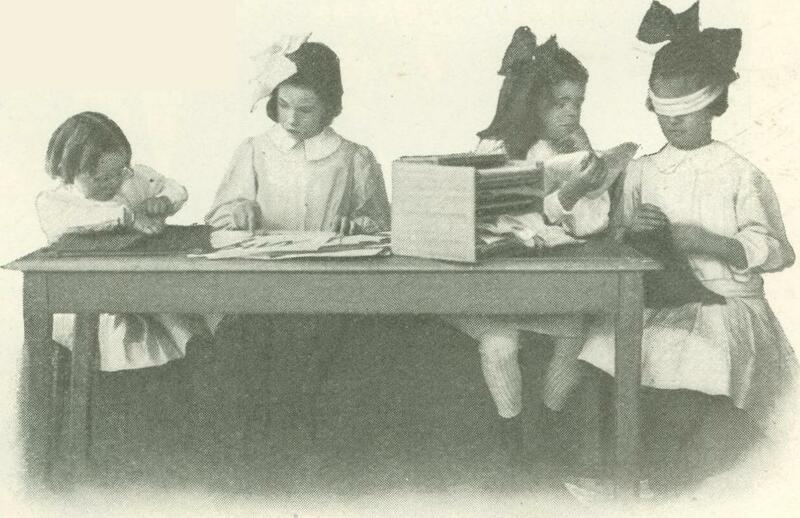 Nearly all were under five - the youngest was hardly three; none, of course, had ever been to school before. They represented all varying grades of intelligence and character. There were those who were exceedingly high-strung and disorganized, others who were unre­sponsive and methodical, others who had so little muscular control that they could hardly get out of a chair without knocking it over. There were some so quiet and unaggressive that they could hardly be forced to leave their corners, others so fond of applause that they constantly demanded the center of the stage. There were many bril­liant minds; like all Amer­ican children, however, nearly all had been unconsciously over­stimulated. My problem was to take these children, place them in this school-room with the Montessori materials, and, with as little positive direction as possible, lead them, largely through the development of the senses, into the knowledge and the use of their intellectual powers as well as to normal physical con­trol. The average person does not compre­hend the extent to which little children are enveloped in a mental fog. It is, after all, the senses that keep us in intelligent contact with our environment; but little chil­dren have these senses developed only in rudimentary fashion. Only by training does the human animal learn to use his sense of touch - the little child scarcely knows the difference between rough and smooth and cold and warmth. He does not see the ex­ternal world in clear and definite outlines; to his blurred vision there is little difference be­tween a square and a round object. My duty was to lift the children out of the confused mass of impressions in which they moved and make them see the world in its accurate proportions. According to the Montessori philosophy, self-control comes, not through any particular inward and spiritual grace, but through the control of the senses. Montessori recognizes that these senses are, in many ways, man's richest inheritance; that he who has them completely developed and under control rules his own body, and con­sequently his mind; and that their mastery should be an essential preliminary to all education. That the spiritual life is touched and awakened in a surprising and beautiful way has been to me the most evident, though the most mysterious, result of the method. And through this sense development I hoped to bring out each separate individuality, to create an independent and self-reliant human being. Chil­dren, just like adults, tend to lean upon one another; there is a natural gravitation from the younger to the older, from the weaker to the stronger. Human nature being what it is, this sense of dependence, to a certain extent, is in­evitable, both in children and grown-ups; but all have certain defined characteristics and abilities, which, given a fair oppor­tunity, will disclose themselves. I gave no lessons just at first, but limited our use of the materials to exercises in which the children learned to carry the various objects from shelf to table and to replace them again in the established order. They were told that as soon as they understood the use of the materials they would be quite free to take them, use them, and put them back again. A very widespread misconception seems to be that in the Montessori schools children are at once given full access to all the exercises and are allowed to select any ob­ject that at­tracts them. An instant's though will show a course would lead to license, to anarchy, and never to liberty. The child is, indeed, allowed to make mistakes, and the teacher must for the most part withhold her hand and make no direct correction; but - and here lies the point which is often overlooked - the child is not allowed to make mistakes that arise from immaturity or from a failure to understand what he is to do with the material. This indicates the teacher's duty. First, she must from her observation be able at the be­ginning to present the materials to the child in a sequence which for him is a logical one. Once started upon the road to intellectual indepen­dence, he will indicate clearly what this sequence should be. And, second, she must be very sure, before leaving the child to use the material alone, that he has understood her lesson as an explanation of what he is to do with the objects. It was at first frequently necessary frankly to take from a child's hands a game of which he knew the use, but which was be­yond his powers. The first weeks of the school were very discouraging, and any teacher who will pause and consider my problem will see that it must necessarily have been so. I felt with painful acuteness that Montessori spoke truly when she said: "These first days of disorder, though they reveal much to the teacher, are yet a most trying and diffi­cult time!" 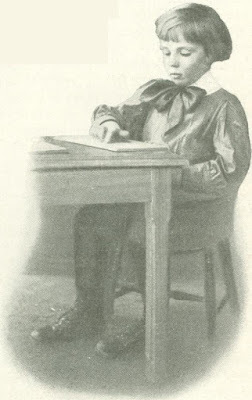 I was unusually fortunate in having as my assistant Miss Meda Bagnell, a broad-minded young teacher gifted with that love and under­standing of children without which the best method is of little use. To her encouragement and help, given so freely those first days, is due much of the success of these later months. We felt our way almost blindly, resisting the temptation to resort to group work in order to establish temporary order and discipline. We had much free rhythm work, much outdoor play, and during such periods I was able to ob­serve the children and to select individuals who seemed ready for work and to present to these such of the simpler exercises as I thought might awaken and set in motion that inner self-activity without which no real change can take place. When I had given such a lesson, I tried to lead the child to repeat the exercise of his own accord. We were kept extremely busy trying to follow that Montessori rule for discipline which reads: "Discipline for the child begins when he becomes able to judge for himself be­tween good and evil. He can only come to such knowledge through personal experience. We must, therefore, check in the child whatever hinders the comfort or convenience of the collectivity, or whatever tends toward the estab­lishment of a coarse or ill-bred act." The comfort and convenience of the col­lectivity was an unconsidered thing to these little beings living for the first time in such a community. They often snatched things out of one another's hands. If I attempted to explain one object to a particular pupil, the others would drop what they had and gather noisily and aimlessly about us. When I had finished they would frequently all pounce upon this identical object, and even quarrel for its possession. They lacked the power of atten­tion or concentration. At first they showed little interest in the materials. They looked upon them as toys, and they all had far more intricate and beautiful toys at home. One boy had so little self-control that he could not sit still long enough to run his finger around a small circular object. In many cases the children's move­ments were entirely aimless. They would run around with no particular objective point, stumbling against tables and overturning chairs, and stepping on the materials. They would start for one place, and suddenly run in another direction, pick up several toys at once and then throw them all away. Such behavior, however, was not abnormal, and not necessarily discouraging, One must keep in mind that the children were only from three to five years old, and that they were haying their first real taste of liberty. In a few days this nebulous mass of whirling particles began to assume definite form. Slowly the children began to orient themselves. In the several articles which they had at first despised as rather stupid toes they began to discover a genuine interest; and, as a result of this new interest, they became strikingly individualized. An article that would engage the absorbing attention of one child had not the slightest attraction for another. The battle is finally won when the child detects something in a par­ticular object that spontaneously arouses this interest. Sometimes this enthusiasm arrives with a strange suddenness. I tried one little boy upon nearly every article without arousing a spark of attention. Then I casually showed him the red and blue spools and called his attention to the difference in color. He at once seized upon them with a kind of hunger. He learned five different colors in a single lesson; in the next few days he took up the articles he had previously scorned and mastered them all. One boy who at first had little power of concentration found his outlet in one of the most intricate of the Montessori materials - the so-called "Long Stair." He played continuously with it for a week, learning to count and to do simple sums in addition and subtraction. Then he returned to the cylinders and several other more simple toys and readily learned their use. As soon as the children found their objects of interest, disorder disappeared. They found more entertainment in their blocks, their colors, and in their stairs than they did in mental vagabondage. They now had a new and serious purpose in life, and with this power of concen­tration came a real independence, Children who had previously hung upon each other, their nurse, or their parents now struck out for themselves. Of their own volition they found a practical application in the buttoning and tying games, and began to dress and undress them­selves. Others who had not yet mastered the art of feeding themselves now began to resent the assistance of their nurses and to do it themselves. In the school-room they continually showed their growing independence by ceasing to imitate one another. There was one little three-year-old girl, in particular, who had been dependent upon a precocious sister of five. Whatever the older sister did the younger implicitly imi­tated. If one had a blue crayon, the younger must have a blue crayon too. The younger could not even eat her toast unless her older sister ate hers at the same time. This went on for some time, when suddenly the little girl became interested in the "pink tower" and began to work inde­pendently at it. One day Jean, the older sister, saw with amazement that Dorothy was busily engaged with this new toy. "Why, sister," she said, "I am fill­ing in a circle and you are making a tower!" For the younger child the act amounted to a declaration of independence; she now began her real life as an individual, and ceased to be merely the little sister of a very precocious child. These children all showed that pride of discovery that comes to all men and women when they have really done something themselves. They would jump up and throw their arms around my neck when they had independently mastered such simple things as the cyl­inder, or the buttoning and tying frames. "I did it all myself!" "You didn't know I could do it, did you?" "I have done it better today than I did yes­terday!" And with this new independence came real disci­pline, of which perhaps the finest evidences were the respect for work as work and a consideration for the rights of others. If a child wanted a particular-object which one of his classmates was using, instead of snatching it from his hand, he would wait quietly by until the latter had finished with it. 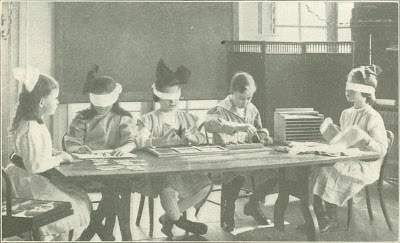 This training also had the desired effect of sharpening the senses; and in the observation of distinctions these American children showed greater powers than the Italians with whom I had worked. The Italian children are more sensitive to form, and in­deed to all sense impressions; they will recognize a circle, a square, an ellipse by the sense of touch more quickly than Americans. On the other hand, they do not have the ability to discrim­inate, to note differences and to make comparisons that American children have. This is only another way of saying, of course, that American children have more ini­tiative, greater reasoning power, or, in other words, more originality. The so-called geometrical insets served as a useful test. These are wooden pieces of different shapes - circles, squares, ovals, triangles - which are made so that they fit exactly into corresponding wooden frames. The game consists in taking up one of these insets by a small button, following its contour with the finger-tips, and fitting it into its appropriate place. The Italian children learned to do this more quickly than the Americans; but, having ac­complished the task, they were content. My American pupils, however, made certain independent alterations. "Look here!" one little boy cried, with all the excitement of discovery. "I can fit this triangle in three different ways. The circle goes in any way you put it. The square goes in four ways. The ellipse fits in two ways. But there is only one way you can fit the oval in!" Another called to me that she had made a star by placing the triangle crisscross against its appropriate opening, and that she had also produced new but symmetrical shapes with the other forms. I have never seen Italian chil­dren do anything like that. Simple as the opera­tion seemed, it really indicated the budding of certain of the highest qualities of the human mind - inventiveness, originality, the logical faculty, the ability to deduce general conclusions from carefully observed facts. 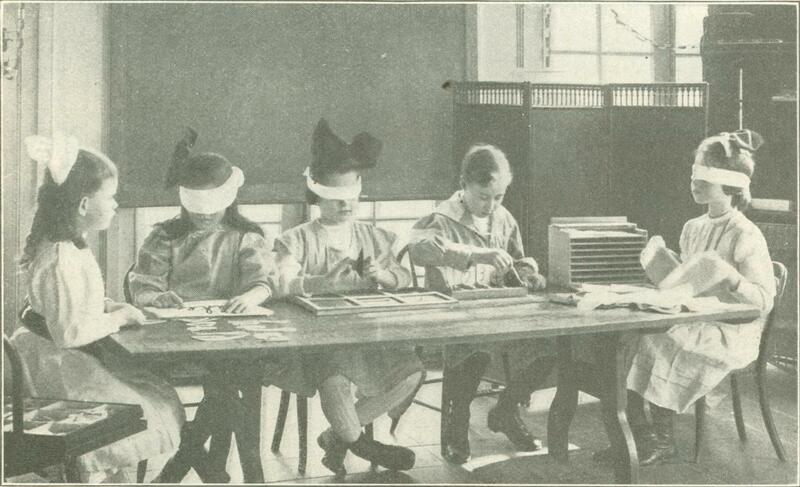 And so, in the course of several months, these children, who began with the most rudimentary sense perceptions, acquired a reasonably complete control of their eyes, their hands, and their muscles. In other words, they were becoming intelligent and educated individuals. And now they be­gan to manifest interest in those wonderful toys which have most impressed the popular imagination - the sandpaper alphabet. This has already been described in McCLURE'S MAGAZINE. Briefly, it consists of separate script letters, cut out of sand­paper and pasted on small individual card­boards. Its use at first is merely an­other lesson in the sense of touch. The children move the index-finger along the letter, just as they move the same finger along the sand­paper strips on the "smooth" and "rough" tab­lets. The teacher carefully teaches them to trace these letters in the proper way, beginning and end­ing at the same points as one does in ordinary writ­ing. In this way the child not only learns almost un­consciously the shape of the letters, but the muscles acquire the neces­sary exercise for the precise movements required. 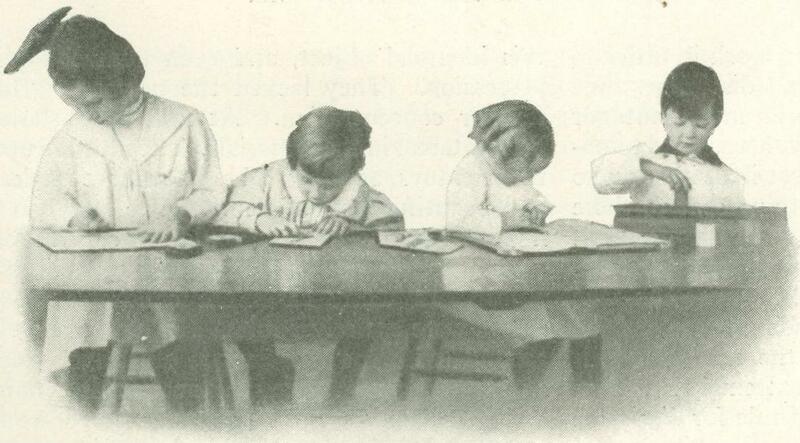 In the Montessori schools, the child acquires the physical skill demanded for the production of written words long before he makes any attempt at writing. We teach him the pho­netic value of each letter as he traces it. As the index-finger moves along the t, we make the usual phonetic sound of this consonant and get him to repeat it. In a short time the average child has mastered the whole alphabet. In applying this method to the beginnings of reading and writing, I have, of course, had to face the problem presented to us all by the unphonetic character of our English language. I make no attempt here to outline my experi­ments, for I do not feel that they have gone far enough to be of any great value. I will only say that, so far, I have followed with great success the ordi­nary phonetic methods, sub­stituting for the blackboard drill on word-families a set of cards upon which the phonograms, cut in sandpaper, are mounted. The children learn these as they did the letter sounds, and eagerly make spontaneous use of them, tracing over and over again -ing, -at, -ate, and so on, giving the sound and readily forming words by placing the separate letters before these groups. The word and sentence method, which I have always used with great success, will, I believe, grow naturally out of these lessons when we begin our silent reading lessons and make use of the blackboard. I made no attempt to force this wonderful Montessori alphabet upon my Tarrytown children. Whenever I thought that a child was prepared for it, I would perhaps quietly call it to his attention. If he showed interest, then I let him have it; if not, he returned at once to the other materials. A boy who originally rebelled against entering the class at all was one of those who made the most rapid progress. At first he was exceedingly nervous and discouraged; but the work had not gone on many months before he had himself under fairly good control. Though at first he could scarcely use his fingers, in a couple of months he took up the sandpaper letters, and learned the alphabet in two days. Soon he could pick out the letters for practically every sound, and, under my direction, put them to­gether so as to make almost any simple word. One day, when I used the word "plant," he looked up and said: "That word has a p and an a and an n and a t in it." Finally, after more exercise of this sort, he felt the "explosive im­pulse," went to the blackboard without any prompting from me, and wrote his name. He followed this up by writing other words that were associated with his every-day life - "gun," "daddy," "dog," "cat," "red," and soon. He accomplished these wonders about four months after his first day at school. I t so happened that on this day he did something else which he had hitherto disdained - went with the other chil­dren into the rhythm exercise. In his delight with these accomplishments, he ran up to me, threw his arms around my neck, and cried: "I can skip and I can write, and I just love school!" The American children do not, as a rule, dis­play the same enthusiasm about writing as the Italians. Probably the reason is that writing strikes them as quite a normal human proceed­ing; they have seen people doing it from their earliest recollection, while the Italian children have not. One of my brightest little girls, sud­denly feeling the impulse, went to the board one day and wrote several little words and a number of letters. "Oh, see what Caroline has done!" cried one of her schoolmates. "Oh, yes, I can write the letters," she replied in a casual fashion. The next day she went to the board of her own accord and wrote the word "silence." She turned quietly and said: "I can write `silence.' "Another child jumped up and rushed to the blackboard to get a closer view, whereupon, to her consternation, Caroline rubbed it out. "Oh, it was just something I wrote," she said simply. "I can write it again." And she did so. Several others have "exploded" in the same way. My children do not write with the same facility as Montessori's. However, I have had theft only half a day, whereas the Case dei Bambini hold sessions all day long. 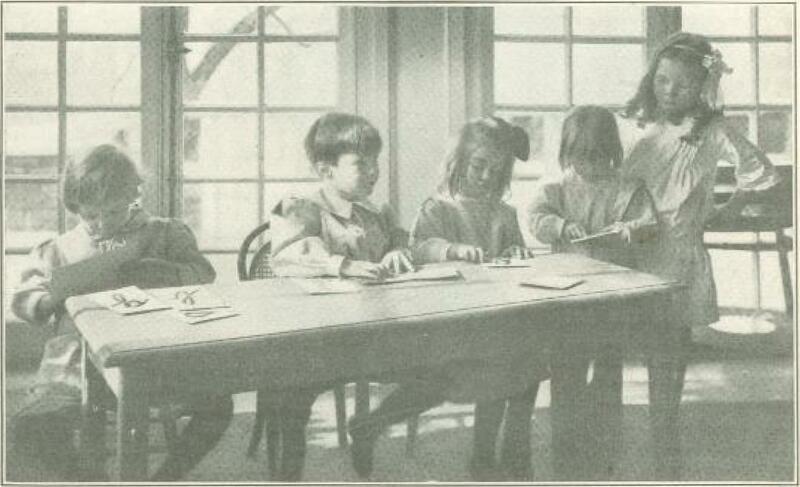 More­over, at the present writing the Tarrytown children have had only about five months' schooling. Before the term is out, and before most of them have reached their fifth year, I confidently expect that most of them will have reached the writing stage in their development. 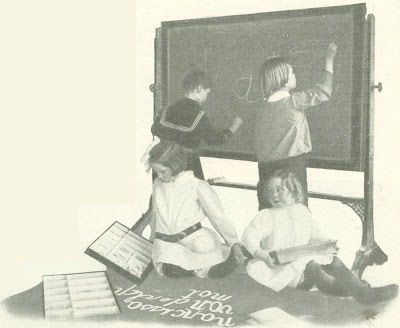 A spontaneous arithmetic lesson which oc­curred a few weeks ago affords a characteristic example of the delightful surprises that now occur almost daily in the school - since the children, having learned to be independent and happy, have arrived at the period so well described by Montessori. She says: "The children, having reached this point, fairly run toward knowledge." In this particular instance, a child of five, who had not played with the red and blue blocks of the Long Stair for some days, had suddenly announced his desire to play with them. He had arranged them properly, counted the al­ternate sections of red and blue, had traced with his finger each sandpaper figure and propped it against its corresponding rod. Suddenly he took up rod 1 and, placing it after rod 9, announced: "9 and I make to; 8 and 2 make to"; and so on. I happened to be standing near a black­board, and asked: "Shall I write what you have done?" Upon his delighted "yes" I proceeded to write as he built, "9+1= 10"; "8+2= 10"; and so on down to "5 + 5 = 10." I said noth­ing in explanation of the signs "plus" and "equal" until the whole column was written. Then, turning to the delighted child, I asked if he understood their meaning. "Oh, yes," he said, reading the last combination aloud; "5+5 =10. This" (pointing to +) "means and, and this "(pointing to =),"means 'equal.' "It is only another example of the truth made use of by all good teachers, that, if the child is eager and interested, ordinary obstacles disappear. This child repeated the combinations in clear figures, and, as the lesson aroused all the others who had mastered the figures, the board was soon filled with a variety of simple combinations. The finest results of this first American experi­ment, however, are not necessarily these more showy accomplishments, bet the development of individuality in the children - the mastery of self, the growth of independence, and the recognition and use of the senses. I have been able, likewise, to dispose of the criticism which is most frequently brought against the Montes­sori system. The Italian educator, it is said, makes the mistake of bringing the children too closely to the earth, as distinguished from other methods which encourage imagination and deal in fairies and knights and imaginative games. 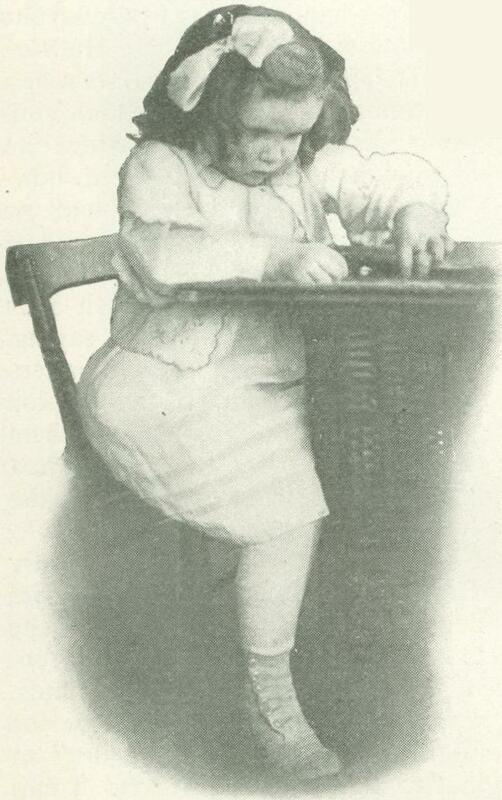 Dr. Montessori makes the children see the world as it really is. To her a block is a block, not a castle; the hands and fingers are anatomical structures, not pigeons; the children learn real geometrical forms by their right names - triangles, squares, circles, ovals - and not as symbolic abstractions. Does this not entirely crush the imaginative instinct, it is asked, and so destroy one of the qualities most essential to moral and intellectual growth? So far as I have observed, my Montessori children still have their imaginative faculties unimpaired. They are just as much interested in birds, trees, flowers, snow, and in people as the children of the kindergarten. The imagination plays little part in the Montessori schools in Italy, simply because imagination is not the predominant quality of the Italian mind, and never has been. The basic purpose of the Montessori Method is to bring out whatever is in the child, and, since the Italian child is not naturally imaginative, that quality does not appear. On the other hand, the American child is highly imaginative, and, according to its very genius, the Montessori system does not destroy this quality, but causes it to flower. I have had plenty of story-telling in my school, but in this, as in everything, I have followed the Montessori idea. The chil­dren have not been compelled to form a circle and listen to the story, whether they wished to or not. I have said, "Now I am going to tell a story; anyone who wishes may come over here and lis­ten." Often all would come, and often three or four remained at work. Occasionally those who came would leave in the middle of the story and occupy themselves in other ways. I made no attempt to recall or hold them, because I wished to see what stories interested different children. The child re­veals himself in this just as he does everything.